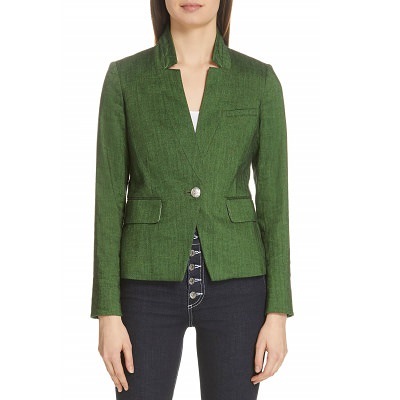 A more affordable option is this one-button blazer in what Express calls “Amazon green.” It’s $128 and comes in regular sizes 00–18. I’d like to get a leather couch. Style would be clean/modern. Do I go with black or brown? A black leather couch seems so extreme but then I’ve seen some done really well in inspiration photos. If brown, which brown? What I’m being drawn to right now is sort of a medium camel, but is this trendy or classic? I’d like to paint a (rental) apt for the first time ever (I have permission from the owners). If you could paint the living room and two bedrooms (one is master and one is nursery/guest room) of a small apt any color and you knew that you’d only be living with it for 3-4 years, what colors would you choose? I was thinking generally lighter in shade but could consider going darker in the master. Would you paint the ceilings (no molding between walls and ceiling)? Finally, walnut is a classic wood, right? I know it’s been my (aspirational) preference since I’ve been an adult, but now that I want to actually invest in some real furniture I want to make sure it’s not on it’s way out of style and being replaced by darker or lighter woods. Don’t do anything that looks really good in “inspirational” photos unless you can pull off the entire look. Burgundy is a good darker neutral. I have an “oyster” leather couch – sort of off white. It works well, looks great, stays clean fine (no kids, pets prefer not to sit on it, I think because it is slippery – they sit on blankets on it or avoid it). A friend has a similar sofa that also looks great in her house. We both bought these sofas before meeting each other so weren’t influenced by the other. That sounds nice. We do have a small daughter but I feel like off-white leather might actually show fewer stains than brown. Can I ask where you got it? I got it from a local independent furniture shop but I think my friend got hers from Rooms to Go. Wood tones have generally been “out” in terms of kitchens and home architectural features, but I anticipate a mid-toned (like walnut) will swing back into popularity (we’ve done the light pine/blonde of the 90s and the espresso of the early 2000s so I think we’re due for mid-toned).Plus, we’re seeing more and more of the mid-toned wood in the farmhouse trend currently. The most important thing though is that you buy what YOU like. Mid toned wood, as well as a Jacobian mid-dark wood are really classic and timeless. It’s when we get into wood extremes and heavy undertones (cherry/red mahogany and I’d argue gray which is really prevalent right now) that we get into trendy territory. If it’s a neutral to yellow/gold undertone, IMO it has more staying power. I would avoid black leather. A design friend steered me away from a black leather chair because she said black leather always gives her “casting couch” vibe (don’t look it up). I don’t know how true that is, but now that I know, I can’t un-know that. FWIW, we’re considering replacing our leather couch and so far the best one we’ve seen in our budget is the Tyler from Pottery Barn in Vintage Caramel. For the walnut, I was thinking more like a dining table/the legs of chairs, bed, etc. Not cabinets or really large architectural details. Thanks for your thoughts on the couch, I’ll steer away from black. Yes, I understand, I think that when we see woods in kitchens, we’ve hit peak wood trend saturation. We’re not quite there yet with midtone rustic wood (getting there, I went to an open house that had a gorgeous wood and white kitchen which was very contemporary). Yes! We’ve considered Room and Board, but there aren’t any showrooms near us. We love Mitchell Gold Bob Williams, which seems like the next “step up” in quality, but it seems like they’re ranging in the 4k-6k range instead of 2.5k-3.5k. We may hit up the MGBW outlet when we see some relatives, so we’re hoping it’s fruitful since they can ship. You may want to find someone to help put everything together. From my experience, it is worth it to avoid expensive mistakes on furniture. For my $0.02, either color of leather can work – depending upon how you style. As for paint – it really depends upon the light in your place. Which is another reason to get expert help. Thanks! I wasn’t really considering this since it’s seems like an extravagant expense for a rental, but you could be right. This would be any interior designer, right? Any clue how much this type of service would run for a small 2-bed apt in a HCOL city? You might consider working with a virtual designer (Havenly or the like). I used Havenly for a smallish project (refreshing my living room with new pillows, throws, and a coffee table). I was very happy with their customer service and the end result. I will caution you/give you an early heads up that they work on commission (as do all designers?) so I felt some pressure to purchase through their service rather than directly from the source. They did carry all the sources I cared to use and their customer service was top notch, but returns were a bit more trouble (though still doable). Most interior designers who are not affiliated with a retailer work on an hourly basis (rates are about $125/hr in my MCOL area) and may also receive a commission through furniture they purchase (ask for details if you hire one). I’ve had very positive experiences and their input makes a world of difference. Whether it’s worth it to you depends on the amount you’re investing and if you can find the right fit. If you work with one, be very clear about how much you want to spend and be as specific as possible with your preferences to avoid wasted time. I think the better question to answer first is: what style or color palette do you like? Or if not that, how do you want the room to feel? It’s very easy to see a trendy looking home and like it but not want to live in it. It’s better to determine what you like, then determine what the trendy version of THAT is. There are trendy ways to do minimalistic, maximalistic, cool tones, warm tones, lots of color, your favorite color, one main color with accent. Do you like a room that feels comfy or chic? Thanks! I generally know what I like, but know that I’m getting into the nitty gritty of looking at a million paint colors that look very similar, I’m second guessing myself. I also have never painted a place I’ve lived in, so I’m worried that what I think looks good on “paper” won’t look good in practice. Style is definitely modern/minimal, and somewhere between comfy and chic. Also, we haven’t even moved in yet, I wanted to get the painting done before we moved in to have one less thing to worry about. So it’s a little harder to gauge it. Please don’t paint the ceilings. It’s such a pain to paint back flat ceiling white and it makes the room look smaller. To add to this, re-painting the ceiling with the same flat white paint that is already on there will likely make it look cleaner. I did this when i moved into my condo. it made a big difference. Really? I know I’m asking for design help so am clearly not an expert but… I totally disagree. There are obviously super traditional style leather sofas and Lazy-boy style sofas, but that is not what I’m talking about. Maybe it’s regional, but from what I’ve seen, leather sofas definitely seem to be found in the parents’ houses and not in the young adult (30’s age range) houses. Same as the shoe conversation from last week. Leather is out and suede is in. That said, you should get what you like OP. I think clean leather (like, not lumpy lazy boy or overstuffed leather) but the kind you see on some Room & Board couches (or Thomas Moser couches, a girl can dream :)) is classic. I’d go with camel or brown, not black, personally. I think that’s just one person’s opinion. There are certain classic materials that don’t go out of style – only how they are done goes in and out of style. Leather falls into the category of wool and cotton as an essential and forever basic fabric that can be done in an infinite amount of styles. I agree with you COtoNY – the lines of the furniture and the styling of the leather (ex. distressed versus patent, brown versus black, etc) that make the furniture. Hm. We bought a grey leather sofa five years ago from EQ3 in a modern style — and the sofa has held up well with plenty of daily wear from two toddlers. Agree. Most uses look really dated. I feel like this couch is super trendy right now, to the point where it and a beni ourain are the ultimate basic b look: https://www.article.com/product/11833/sven-charme-tan-sofa . Maybe people are thinking of older styles of leather couches, like your parents’ Natuzzi? I have a black leather couch. There are times when I wish I’d gone for a dark brown. However it has held up extremely well (it is 25 years old) and does not ever get spots – I can’t say the same for the brown leather chairs I have in another room. I like Benjamin Moore paint colors, specifically colors from their historic collection. Edgecomb Gray is a good grayish-beige. Revere Pewter is a good true gray (better in my opinion for kitchens and bathrooms). I second the recommendation for Room & Board for the couch. I have had mid-range couches (from Pottery Barn, Crate and Barrel) which have not held up for more than 3 or 4 years. Generally PB wood furniture is very “soft,” meaning that it gets scratched easily. Don’t forget about Ballard Designs. Drapes and/or blinds are critical to impacting the overall feel of a room. Our walls in our new house are Benjamin Moore Natural Linen and I loooooove the color. It is so easy to live with. The wall color really helped sell the house. I bought a house that had an oxblood leather couch (they took it with them, of course, but I admired it during the showings) and it looked really classic and sharp. I would get one if I didn’t have cats. For colors, check out the Farrow & Ball colors (and have Lowe’s color match them). Their colors are beautiful and there are a ton of pictures on the web you can google to see how it looks in various spaces (i.e., search “ammonite bathroom”). It sounds like we have a similar design aesthetic (my home has a lot of walnut and cognac leather) and we just painted our (rental) bedroom the Lowe’s color-matched version of Farrow & Ball’s “smoke green” and I’m obsessed. It is gorgeous. For the lighter Farrow & Ball colors, I have not had as much luck with the color matching, but the deep tones are easier for Lowe’s/Home Depot to get right it appears. I went in house after being at a law firm for over 4 years. I have been in-house at the same company for a year and half. The job is not bad- my hours are 8:30-5, I get 4 weeks vacation per year, and pay is good. I also get along with the GC and other attorneys (very few attorneys total). I do diverse work since we have limited attorneys so everyone has to do it all. However, it is a small company- so there are always associated risks. and my boss did not like it when a previous attorney left after 2.5 years so I am sure she will be very upset if I leave. I have an opportunity to go in-house at a big pharma company. It is one of the best in the field. The pay would be about the same or slightly more. I know someone who works there and the hours are also 9-5. there are 5 weeks of vacation (in addition to being closed between Christmas and new years). The opportunity would require me to do more specific work (I wouldn’t have to do it all like I currently do- litigation, contracts, regulatory, etc). Their in-house dept has around 50 attorneys so everyone just does what they do. Should I make the switch? Thanks in advance! I guess one of the questions I have is about the commute since a long commute has such a negative effect on my quality of life. What do you want long term? It sounds like staying with your current company could potentially let you leap frog to a more senior role at some point because you have broader experience. It may also be less stable because it’s a smaller company so changes to the org are more likely to affect you. If you want something stable and good, the new company is (probably) more stable and if you just want to do one thing then it sounds like the right move. Other things to consider: any equity compensation at either job? What are the opportunities for advancement? I would not factor in the GCs feelings. Its unfortunate that she may be upset but her feelings are not something that should factor into your major life decisions. People change jobs, it’s the nature of being a manager. If a better opportunity comes up, an employee is not obligated to pass it up because of loyalty or whatever to a company. Think about it this way, if your current company took a huge financial hit and had to do layoffs, you’d be upset if you were laid off but that wouldn’t stop them from laying you off. Don’t give loyalty to a person/company who won’t give it back. I thought this way about a decade ago. Many women cannot let go of the socialization that anyone’s needs matter more than your own!! No company (or any GC) will consider your feelings when they lay you off during a reorg – so its is not your obligations to care about the GC’s feelings regarding you moving on. Also, fwiw, I left a 50ish person law department at a large org for a small law department/smaller org and have been much happier in the small group. Part of that is there was a lot more upward mobility in the small group based on when I got there that was absent in the larger group. Also agree with the commenter below on the politics of larger groups, mine was like that too and I disliked it immensely. Do you enjoy the current variety or would you rather focus? I enjoy the variety- but it could be a double edged sword. Sometimes it feels like every “new” thing is a mountain to climb. And since it’s a smaller company, I do not have as many resources. If I focused on one-two main things, I can get really good at them and feel less stress, hopefully? and with two little kids, I would love that. You really don’t sound like you know what you want at all. So many caveats to every answer. Yes, there are two sides of every coin! You can still prefer one over the other. I think you should be aware of how political large in-house legal departments are. It’s just a whole different ball game. I just left a large department that was pretty collegial and where I was generally well liked – I *still* found the internal politics to be completely exhausting. People were constantly positioning and angling for promotions. There were a lot of personnel moves that were based on tenure and/or politics as opposed to merit. Just think about this before making a leap. Thanks, this is helpful. I am not super ambitious at this stage in my life (two little kids). I kind of want a position where I can coast more. Do you think that would be possible in a large in-house legal department? Did you apply for this new job or were you contacted by the company? I ask because that can be very telling. If you applied, think of the reasons you applied. It sounds like the only major benefits of taking this new job are the name and recognition of the company and more vacation time. As JazzyRose asked, what about commuting time? Is there any travel involved? Benefits? Is it really 9-5 or will it become 9-6 over time? Are you burning a bridge with your current boss if you leave so soon? What is the culture like at the larger company? *If that’s a real closure. My very good friend works for the three letter British pharma company, but in HR. For her, it’s a real closure. But I’ve always wondered about legal — like, are they really going to not close a client deal by year-end because pharma is closed, even when the client is open? I think year end closure is huge. I think it would be a “real” closure- but obviously if you’re working on a big agreement then you would have to continue. But not sure how often that happens. My contact said it was a real closure this past year. My firm closes every year from Christmas Eve until after New Year’s. We let out clients know and we put on the out of office. Most lawyers check their email and might log in from home, but generally not a lot is done at all during that time unless you are trying to bulk up your hours. Just chiming in to say that if it were me making the jump, I’d need to negotiate more than the same or slightly more pay. They said they can’t go above but they will see what they can do. They said I would appreciate that once I’m there- because my salary can’t be too much higher than people who are currently in the same position. “They said I would appreciate that once I’m there” Maybe I’m just ignorant, but that is totally nonsensical to me. That is total BS reasoning and hearing that kind of excuse would be a red flag for me. If the salaries and commutes are comparable, I would think twice before leaving your current position… You don’t say you’re unhappy at your current job, just that the company is small. Plus, after 1.5 years in your current role, you’ve built up your reputation and general goodwill at the company. Ultimately, it’s the devil you know vs. the devil you don’t. If there are other pros/cons not mentioned in your original post, those would obviously come into consideration as well. Good luck! What about the stability in the big company? And the name recognition? Should I count that? I worry that positions in such companies don’t come often and I don’t want to miss my opportunity. I work at a big US-based pharma company in the medical department and interact a LOT with legal. Please make sure your hours would be 9 to 5: I see a lot of in-house lawyers that will support other countries/regions and that will work early in the morning or late in the evening to attend meeting/call. The lawyers are interact with are all working more than 50 hours a week. Please ask about your workload and your tasks – which departments or regions would you end up supporting more: R&D has different needs that commercial and the tasks are not the same. Would you be based at the head office? Opportunities are often better if you are at the main head office. Ask also about working remotely 1-3 days per week, if this is of an interest to you. In my experience, big pharma company tend to be generous with vacations ( 5 weeks vacations and closed during the holiday is common) – what is different is the possibility to work remotely, the extended mat leave, equity compensation, etc. Good luck! Also, like AnonInHouse mentioned: if there is a BIG deal/thing to happen during the end of the year holiday you will be working – the company is not shut down. I saw/still see vacations get cancelled/pushback, people working overtime and texting their SO to say they will be late frequently. I would be working in the main HQ. To the best of my knowledge, I would not be working on too many international clients. My contact says she can wfh once a week. They have equity both in the new company and current company but overall benefits better in new company. You sound like you’ve already talked yourself into this job. +1 – not in legal, but having worked in Big Pharma, I would be SHOCKED if this job is really 9-5. I have two little kids. I do like the variety I do now, but sometimes feel like I do not have enough direction. Also, since I’m the most junior attorney, I get everything no one else wants to do. I think the new company would have more structure to it and doing one kind of thing may not be too bad. I think it will give me the opportunity to get really good at what I do. And I would love to have that stability with two little kids. Is part of this that you feel like you’re not very good at anything you’re doing because you’re new to it all and it’s always changing, and that if you were doing one thing all the time in a big company you’d have a chance to get good at one thing and feel more confident? If so, I’d not move as a way of feeling more skilled or confident. I’d stay at my current job and get good at it. Also, does it look bad to change jobs after 1.5 years? will that be a “dent” on my resume? So, my read on your comments is that you really want to take the job at the big company. I don’t think it will be a dent on your resume to change jobs after 1.5 years, provided that you don’t have a history of making moves after short stays. If you think you might be able to stay at the big company long-term, I would also suggest that a short stay at your current company might not matter very much down the road. That said, I’d caution you against going to the big company for name recognition or worrying too much about how this will look on your resume. Your performance at a given employer is ultimately going to be what counts, and if you pigeonhole yourself into doing only one thing, you may find that it’s still harder to move on. I would also say, big pharma consolidates at a rate greater than any other industry I have seen. When that happens, frequently there are layoffs to reduce redundancy. Are you confident you are not giving up job security to take the job? Also, you did not mention bonuses. Most pharma employees would expect to receive a bonus of some sort. Are you factoring that in, or is it a wash with your current bonus structure. Agree with poster above who said watch out for internal politics with a 50 person group. I’d also try to get an idea of what your role will look like in 2 years and in 5 years. I don’t think a 1.5 year stint looks bad on a resume but you don’t want to end up jumping again quickly since that does start to raise concerns. Ask when you’d have a promotion opportunity, maybe even negotiate for a “look” or check in after some period of time. I just spent ten days off the grid and did not miss my phone or other electronics, but now that I’m home, it’s like I never left and I’m full-on addicted to my phone. I don’t want to live this way. Has anyone had success with dramatically reducing iPhone usage? I’m at the point where I want to use it only as a phone and navigation device, but so many of the tips I see out there for reducing phone usage involve…phone usage (for meditation apps, timers for apps, etc.) Help? Put the phone away, literally. Mine lives in my purse during the day and then gets plugged into a charging station in a rarely used room as soon as I get home. The phone is much less tempting if it’s not right at your fingertips. Do you leave it on silent? I usually do during the day but the phone is near me on my desk so I check the screen frequently. I would love to put it away on silent, but my one concern is not being reachable in an emergency. I leave the ringer on for voice calls but don’t have a lot of other audible notifications. Nobody actually calls me on that phone unless it’s an emergency or a spam call. This is really hard, but I’m working on it. First look at your usage – WHAT are you doing on your phone? Then delete apps that you can delete. For me that was Instagram – I was spending tons and tons of time on it daily even though I was just checking it in spare moments. I decided to take a month long break and now that my month is up, I don’t want to reintroduce it. Next, reconsider your notifications. You don’t have to get into elaborate notification algorithms, but turn off anything that notifies you except calls, texts, and emails. This can be done in one go in settings. For emails, I switched to the gmail app because it only notifies me of things in my “primary” inbox – I can look at promotion and shipping notifications when I want, not when they pop in. Also, like the poster above me, consider where your phone lives. I like to be reachable if needed since I am a parent, so I keep my phone near me at work but on a spot on the bookcase behind me. I will definitely hear it if it vibrates, but I’m not seeing it, so I’m less tempted to pick it up. At home I keep it charging in an out of the way spot in my kitchen. It’s central enough in my home that I can hear it if I have a notification, and then decide if I want to go and check it. But because I’m not constantly carrying it around the house with me, I’m less likely to pick it up and start scrolling. I also found it useful to tell those of my friends who I text with most often that I was trying to be on my phone less – now our texting is less dispersed and more condensed, so I’m not constantly getting sucked into my phone for 5 minutes at a time. They now know not to expect an immediate response from me to a non-urgent text, and know that I don’t expect one from them either. And possibly most importantly, make sure you have a plan for what to do when you would otherwise be grabbing your phone. Having other things you want to do with your time more than being on the phone is the key, I think. I found Cal Newport’s book Digital Minimalism really great on this topic. His philosophical thinking about WHY getting off your phone is important has been more life changing for me than any specific tip from him or anyone else. Turn off all your notifications. No chimes, no vibrations, no lock-screen message. It’s the only way I’ve been able to truly forget about my phone. Otherwise it’s always reminding me that it’s there! +10000 I only get notifications for text messages and phone calls. I don’t have work email on mine so I don’t have to worry about that. I also have zero social media on my phone. I have 2 news sites, one local, one national. I really don’t have many options to just sit and scroll through my phone so I don’t. Taking off the easy unlock features might be helpful (no face scan/fingerprint)… make your passcode very long and complicated? That can help some of the “involuntary” use. changing my phone screen to greyscale helps me a lot. It turns out I like the colors and pretty pictures much more than the actual phone-specific elements. Black and white screen + taking lots of magazines and coffee table books of gardens, homes, etc out from the library helped me cut down my mindless scrolling. I took every app off my phone that I could use for filling idle time. No games, no social media. Everything left is purpose-driven – I’ll open maps to navigate but am never just going to scroll through a map because I’m bored. Phone gets charged in the kitchen and gets put there when I begin getting ready for bed. I’ve added a few additional clocks in strategic spots around the house because I was looking at my phone to check the time. And I wear a watch more. I’m considering getting a landline phone again because it does make me a little paranoid that no one can reach me for 8-9 hours each day, even in emergencies. Having done all of this – I feel much more focused and less anxious. And by making these changes, it’s not that I have to resist urges to use the phone – I check the phone when I feel an urge to but that’s become pretty rare. Thanks everyone for the responses so far. I feel a little depressed reading some of the tips to turn off app notifications, leave the phone on silent, turn off the easy unlock features – I already do all of those things and I still struggle with the almost uncontrollable urge to unlock my phone constantly and check the news or Instagram or what have you. This makes me think the problem is even more severe than I initially realized. I think it’s time to remove Instagram entirely (for starters). Read the book How to Break Up with Your Phone. It’s seriously been life-changing for me. +1 it is a short book with concrete steps and daily tasks to limit your phone usage. I just read Deep Work by Cal Newport which is not at all specifically about phone use, but I found something in there extremely helpful for my own distraction at work. He wrote to take breaks from distraction, not breaks from focus. So what I am trying to do at work (and with my phone in general) is schedule times to use the internet/my phone, and only use during those times. Make a note at your desk of the next time you are allowed to check your phone. He said the breaks can be short (like you’re allowed to do it every hour or fifteen minutes or whatever you need to do your work) but that it’s more about training your brain to wait; like exercising a muscle. I’ve found it useful with my phone so I’m not just picking it up out of habit, but noting the urge and delaying the gratification. I have a PAYG dumb burner phone, and don’t use social media. All my phone is capable of is making calls, texting, and taking blurry photos. It’s extreme, but it works. So this came up in a weekend discussion as a friend had read about it — how do you balance the you only live once/enjoy your life views of the world vs. saving aggressively for the future? Interesting to hear my friends (age 35-50 some single, some dinks, some married w kids) discuss it. Most took the view that as long as you’re saving x% for retirement, you should travel, eat out and spend the rest; and x% wasn’t huge – generally 6-10%. Found it interesting that some in my group are huge savers; they’d never mentioned it before but their views were more like — if I’m not saving 10-15% in my 401k plus another 25-50% of my net, I’m not doing enough — no way I’m jetting off to Paris, Paris will be there next year or in 20 years too. Where do you all stand? Sacrifice now for pleasure later? Or enjoy it while you can? DH and I saved hard in our 20s. We’re in our 30s with 3 kids now and are firmly in “max the 401k and IRA, contribute X to long term savings and spend the rest.” With the huge caveat that we are also separately saving for kids college. But the only reason we can say f-it, let’s buy a boat is because we saved like crazy people in our 20s. We could have done Paris in our 20s but didn’t; instead we are doing boats and vacations (not Paris: see 3 you h kids) in our 30s. My dad’s dad died at 63. My dad is 60 this year and he is still happily working (he owns his own business). He “retired” from his Big Corporate Job at 40 and built his business as his retirement plan- essentially he’s working 3-4 days a week and doing Fun Things the rest of the time. He bought a house on the water and is in all his beach/fishing glory. He has retirement savings of course but his work/company are meant to be a lower key lifestyle job. These are really extreme positions. I save for retirement as much as I can while still living my life, which is neither extravagant nor miserly. Saving 10% for retirement isn’t an extreme position. It’s lower than the recommendation from the mutual fund industry – but it’s more than most Americans do, even those with enough income to cover expenses. The mutual fund industry has those recommendations because it benefits THEM. That’s what gets left out of discussions about the “recommended” amount of saving. Most people do not need $3 million to retire; lifestyles change significantly in retirement and most people end up living on about 50% or less of their preretirement expenditure. Additionally, life expectancy for most people has stalled or is dropping. It benefits banks, mutual fund companies and investment companies for people to save a ton of money for retirement, because they collect management fees off of managed assets. Whether or not that benefits the people saving is less clear and should be decided by an individual. Just as an example, my 90-year-old grandmother retired at 71 and worried incessantly about having enough money. Her health is good (but supported by her Medicare supplemental insurance) and she has a low lifestyle footprint and so has barely touched her retirement savings, to the point that now she is having to redo her will to make sure her assets get distributed the way she wants. We save 12% of our income for retirement and 3% of our income towards our son’s college. We have a fully funded 6-month emergency fund and we have a fund for car purchase down payments and home repairs that we contribute to monthly. That’s all we’re doing as far as saving and that’s all we’re going to do. We’ve had family members who lived into their 90s and family members who died at 57. No one is guaranteed a 30-year retirement in excellent health. If people are forgoing living life now counting on living their best life later, all I can say is, I hope that works out for them. Yes, Paris will be there in 20 years, but they may not be, or they may not be in good enough health to fully enjoy it the way someone in their 40s would enjoy it. There’s only a certain amount of today I’m willing to trade for tomorrow. I definitely fall more into the enjoy it while I can group. I max out my 401k, have an emergency fund, and am on a 10 year student loan repayment plan, but the rest of my income largely goes to travel and I’m comfortable with that. I want to be able to travel while I’m young and able-bodied. The only thing I sometimes question is whether I should be saving more for a condo, but I’ve decided that it just isn’t feasible on a single income without making major lifestyle cuts that I’m not interested in doing at this point. FWIW: DC, 29, single, no kids and no plans for any. Yeah most people are somewhere in the middle. DH and I have always saved at or close to the limit in our 401ks (which is 20%+ of our salaries), but have enjoyed life and haven’t worried too much about saving beyond that. In a few years our mortgage will be gone and all that money will be redirected to extra retirement savings, but in the meantime we’re not going to deprive ourselves of travel or meals out or whatever. I think the answers are going to depend a lot on whether people are savers by nature or spenders by nature — and that probably gets into some personality differences. I’m a saver by nature, so I need to counteract that with the need to enjoy here and now, or else I’ll never do anything. If I were a spender by nature, I’d need to counteract that with a more careful savings plan. I also think it depends a lot on the way you grew up. If your family struggled, you are probably more likely to be a saver. If your family was wealthy (or even comfortable) you are more likely to feel comfortable with spending. Add to that family wealth– whether you stand to inherit money from parents or grandparents– and I think a lot of this comes down to socioeconmic class. Many of of saw our family’s accumulated wealth plummet during the 2009 economic crisis and I think that has had a lot of influence on people in my generation. +1. I have always saved at least 50% of my paycheck because my (solidly middle class but not highly paid) parents struggled a lot with mortgage payments / helping out family in need when I was younger, and because I was acutely aware of how my family’s finances / choice of school district restricted my education choices from middle school onwards (I usually went for the cheapest/scholarship option, and had a miserable experience at an underfunded public school in my teens). And also because I know that my days in BigLaw are numbered. That being said, with the other 50% of my paycheck, I scrimp on housing / new clothes / luxury items (which are less of a priority for me) but do a lot of travelling / dining out (which are my splurges and give me much pleasure — obviously YMMV what you prioritise). Caveat that I know I can afford to not think about my spending too much courtesy of years in BigLaw and my childless, car-less, mortgage-less, student loan-less lifestyle with little fixed costs. I enjoy it while I can. Sure Paris will still be there in 20 years. But am I going to want to hook up with beautiful Parisian men when I’m 60+ and hopefully married? I mean maybe if he’s cool with that but somehow I think it’ll be a different experience. I’m in my 30s, single, and financially stable (for the first time in my life), I’m going to have some fabulous adventures and fabulous lovers all over the world. Tell me more! I’d love to do more vacation hook ups. How are you making these happen? It just sort of happens! I’m terrible at meeting guys at home, but something about being on vacation by myself is intensely freeing. I’ve met men at coffee shops, markets, and yes at bars. But generally I just smile and make eye contact and try to strike up conversation. Even if you just ask for directions/advice on what to do – if he’s interested then he can helpfully show you around! And if not then you still have a local’s insight on something cool to do. This is living your best life, right here! You’re wading into a big bragging topic around where where spending = wrong and saving = right. I don’t know how much is fact vs fiction but remember that most Americans polled could not come up with $400 for an emergency. So if you’re saving at all you’re doing better than average. My personal opinion is that is important to both save and live your life. I’d do a retirement calculator online, play around with assumptions about ages and rates of return, and then see what you can afford to spend every year on extras. If you’d rather do big trips, maybe it turns out you can go every three years. I don’t know. You have to look at the numbers. But any scenario where you have zero dollars for fun stuff is the wrong scenario, in my opinion. I think it depends on where you are in your life. I’m not going to travel a lot because I’m still saving for a down payment (and frankly, all my PTO and emotional bandwidth for traveling go for visiting out of town family). My family never ate out a lot when I was growing up, so not doing it now doesn’t feel like a deprivation. So I’ll be honest, I’m more like your friend who is saving the 19k max in the 401k + another 30-45% of net (which is invested or held in cash depending on what’s going on) and basically only spending on necessities. And I have taken the view that going away for 3 days every year or 2 is enough and anything more is a waste(though eating out for lunch daily and dinner 2-3 nights/wk is my normal as I don’t cook much). I never made a plan that I’d live this way. I didn’t graduate law school and say I’m trying to get to a $1mil or $2mil or whatever NW and retire at 35 or 45. It started naturally in biglaw because there was literally no time to spend and at my old firm, the way to make yourself seen (as a junior) was to always be around — the 1 week you were out on vacation would be the one week there would be a good assignment like taking a depo as a 2nd year and you wouldn’t be there and some partner would be like — well if she cared, she’d be here — and there would go your shot at taking depos like ever. So I got used to always being at work, taking off maybe 5 days total in a year and that was always like the Wed before Thanksgiving, day after Christmas so not vacation but more like travel days to/from home. And as you all know, life goes by fast. So fast forward and I was suddenly 33 and have been living this way for 8-9 years. Which proved ok because I got pushed out of my firm at 33 and didn’t land another job for a year+. As stressful as that was, it wasn’t monetarily stressful because of how I had lived. Don’t get me wrong — I was in NYC so the fixed costs of having a doorman building in midtown, paying student loans, eating out were high. But I feel like I didn’t really spend much beyond fixed costs — never upgraded beyond a studio or starter furniture; never a European vacation; no real shopping beyond just suits I needed for work etc. So yr+ later I land a new job, paying a lot less but still 150+. And then I resume living that way because it’s OMG — a job can be lost in a second and you can be unemployed for YEARS plus I’m looking to re build the reserve I spent while unemployed. But now going into year 4 of this job and just over a year away from age 40, I’m trying to tell myself that I’ve saved HARD since age 25, it’s ok to spend as those investments will still keep growing. Also factored in is that I’ve added days here and there to business trips and really had fun so I’m thinking I need to start splurging on short vacations if nothing else and I want to upgrade my furniture as well though everything I like (the real wood American made) stuff is always expensive, I tell myself those pieces last forever. This sounds sad. You don’t need to live like this. I know I don’t NEED to, but it’s a hard mindset to leave behind – fear drives it. Will take suggestions on how to move past this. Saving is great but if there are BIG things you want to do (a big trip someplace you’ve always dreamed of; climbing a mountain or whatever), don’t get in the habit of saying — I’ll do it at 55 or after retirement. If you can afford it, do those big things in your 20-40s. Energy levels do fall off and what is an adventure at 40, could be a total drag at 55. Heck I feel like things can be a drag now at 38 compared to 25, so I don’t imagine that’ll get better/easier (though I know there are exceptions as I do know people who took up hard work outs, rock climbing etc. at age 50+ and say it’s the best shape they’ve been in). So much this. I’m going to throw this out there and will get told it’s anecdata, but I don’t care: a ton of my parents’ friends had heart attacks or were diagnosed with cancer within months of retirement. Folks, don’t throw caution to the wind but don’t count on “20 years from now” happening either. It might not. This is a constant argument in my house. My family is long-lived, while my husband will be lucky to make it to 60. My field taking several major hits over the length of my career (tech) sealed our fate as unable to retire early, so we’re just doing the best we can. It’s hard. We try to find the median. I land somewhere in the middle. My spouse and I don’t have the HHI to max all retirement options, etc., but we save to match our retirement goals. We spend less on convenience than many people on this s*te (no cleaning service, no lawn service, most meals at home, lots of DIY fixing up our house). Our vacations the past several years have been either long weekends to domestic locations (usually for weddings) or visiting family at domestic locations, often with their financial help. If there is something we really want to do, we plan and figure it out. Our 10th anniversary is next year, and we’re planning our first “big” trip since our honeymoon (currently thinking Hawaii). We’re saving up credit card points so we can use them for flights and hotel. We’re giving up our sports-ball tickets this year, and we’re holding off on upgrading our phones as long as possible. My parents will help us out by babysitting for a week. We may end up going somewhere closer and less expensive than Hawaii, but we agree that some type of child-free week of adventure together feels important for our anniversary next year, so we’ll make that happen at least. – I have not suffered a long bout of unemployment. But I have always feared this. I fear that if I lose my job there may not be another in the 6-figure range, ever. This means I need to save save SAVE because I may not be able to save after I get the axe or simply crash from the insane lifestyle demands of my job. – My parents need a lot of financial support due to medical issues. I have fortunately been able to help them mostly in ways that should become ‘net positive’ for me over time. E.g. I have shifted from writing checks for things to having my main support be providing a home for them – this provides tax advantages for me in the short term and (hoping) appreciation gains over the long term. – I fear major medical issues for myself, as a single person. LTC providers won’t necessarily be solvent. This means I will need more than I could ever save, unless I somehow manage to hang on to my current salary long-term (not likely – I am exhausted). I need help on ideas for a birthday present for my mother. Relevant info: I’m 8 months pregnant, so it needs to be obtainable online. Mom has very specific taste in clothes (Brooks Brothers blouses, Ralph Lauren polos, tailored jeans, etc.) and really has more than she needs. She gets mani/pedis every two weeks already and doesn’t like massages/facials/etc. She is also very particular about scents, so candles and the like are out. She likes coffee, but pretty much only ever gets a drip coffee or an Americano. This is going to be her fourth and final grandchild, but kiddo doesn’t have a name yet, so it’s hard to do any of those personalized gifts. GC to her mani/pedi place or her favorite coffee shop? Fancy coffee? I like La Columbe; available online and they deliver. Stud earrings with baby’s birth stone? Does she like plants or cooking at all? Windowsill herb gardens have gone over well with some of my hard to buy for relatives. Does she like to read? You could do a book of the month subscription or audible subscription. Someone also mentioned a plant of the month subscription on here recently, which could also be a fun idea. +1 to jewelry with all the grandkids’ birthstones. We did this for my mom once the next generation was “complete” and it was a huge hit. (Hopefully nobody gets accidentally knocked up, lol). You might be my long lost sister. My biggest hits with my mom have been the Cuyana smaller leather goods things (the makeup cases, the travel jewelry thing, the wristlet). She doesn’t really pay attention to the brand but likes the quality and I’ve actually seen her use them. Other hits have been more on-trend accessories. Could she use a beautiful picture frame with a family photo in it? Does she make coffee at home? I did a coffee subscription for my brother and he really enjoyed it. I think it was Driftaway Coffee. Name your child after her. In my family we do this when the original person is dead but YMMV! In Jewish culture, it’s a huge insult to do it while they’re alive! Wishing them dead, essentially. Really good coffee, or a good burr grinder? Is she already set on her coffee situation? I got a nespresso with milk frother a few weeks ago and it has been life changing. I’m 4 months pregnant with my first. I’m an associate in a satellite office of my law firm. Of the 12 attorneys and staff in my office 10 of them are currently sick – ranging from pneumonia to upper respiratory infections to the flu to colds (and most of them are here today…even pneumonia attorney stopped in this morning). I plan flee this infested office and work from home after my last morning appointment. I’ve been taking my prenatals and drinking a lot of orange juice since last week. Plus lots of fluids, hand washing, frequent disinfecting, and keeping my office door closed. I have a call into my OB about any preventatives such as Emergen-C. Anything else that you ladies would recommend to stay healthy? Working from home, frequent handwashing and lots of Vitamin C are really all you can do. An OB isn’t going to prescribe Tamiflu unless someone living in your home has a confirmed case of influenza. Zinc! I get the chewable tablets from amazon. I prefer them vs. the lozenges, personally. Check with OB first though! I didn’t do zinc supplements during pregnancy because I wasn’t sure they were okay. +1. My OB instructed me not to so much as take Tylenol without calling her first. (Tylenol, and many other meds, are fine but the point is you need to check every. single. time you take any kind of medicine or supplement). Looks like you’re doing everything you can. Keep the door closed and the viral-humans out of your office and you should be fine. EmergenC is a vitamin scam but if it makes you feel better, go for it! Giving you good germ juju! Pretty much the same things you’re already doing. Can you open windows to get some fresh air? I’d also add some extra fruits and veggies into your diet and avoid sugar (although the research is pretty dubious, it won’t hurt). Get some extra sleep if possible. Really prioritizing that has, I think, helped me avoid a few illnesses during my pregnancy. If you do get sick, hot tea, saline nasal spray, a humidifier, tylenol and SLEEP will be the best things for you. I had a terrible cold around the same point you are now and I really had to take a few days off to rest and recover. Hopefully you avoid catching anything, good luck! I have no idea if it is approved for use in pregnancy but I’m amazed with the Airborne gummies. I went to my in-laws for Thanksgiving leaving behind an office where everyone was sick. She insisted I eat 2 or 3 of her gummies per day. (Package says 3, 3 times per day but that is extreme.) I didn’t get sick. I bought them and have been taking 2/day, 3 when I start to feel like I might be getting something. I have immune disorders and get sick easily and often. I (KNOCK WOOD) have not been sick from Thanksgiving through today. I have had days where I can tell my body is fighting something off. I’m extra tired and achy but even still I didn’t get sick sick. Even if it somehow placebo, I don’t care, I’m going to continue munching them down. I even flew recently and usually get sick after every flight. So far so good. I finally have enough income to boost my savings accounts and invest. In addition to my employer sponsored accounts (rollover IRA from former job and a pitiful pension and a 457 (with no match…) at my current job) I also have opened a Roth IRA. I have an Ally account with separate savings for different categories of savings. However, I’m curious about non-retirement investing. I’m likely to be more interested in index funds than in ETFs but was wondering how/why people use non retirement investing. Obviously there’s a risk of losing that money, but does anyone say put $1000 in an index fund and whatever the interest is is your vacation fund? Or is it more a long term game like the retirement accounts? Aren’t there penalties if you withdraw before a certain age on all retirement accounts? (I know there are on some, don’t know if there are any that get around that). But I imagine that would be one reason, if you think you will need the money before 55 or whatever it is. Index funds and ETFs are the same. Most ETFs are made up of stocks, so with that you’d want to invest long-term, such as for retirement. I put money in taxable investment accounts to enable myself to say yes. Yes to a bucket list vacation, yes to an exciting job opportunity, yes to a dream house, yes to quitting a toxic job without a backup plan, yes to extended leave to care for family, yes to whatever triggers my life goals. Index funds come in two types, ETF or mutual fund. Their main difference is how they get bought and sold. Mutual funds buy in and cash out once per day, at a net value based on the close-of-business price of the holdings. ETF shares trade all day long, like any other stock. In a non-retirement fund, ETFs have a tax advantage over mutual funds. In a mutual fund, you pay tax on capital gains yearly based on the funds trading activity. In an ETF, you only pay tax on capital gains when you sell. Many companies offer the same product both ways. Vanguard, for example, offers their Total Stock Market Fund as VTSAX for the mutual fund, and VTI for the ETF. Other differences between the two can depend on the product and the parent company. No-load mutual funds usually don’t have commissions or sales fees, while some ETFs do. However, many companies offer fee-free ETF purchases of their in-house products, though that same fee might not be waived for sale of the ETF. Then you get into bid/ask spreads on ETF, which penalize people for quickly moving in and out of the funds. So, for example, if you bought VTI at $99.99 bid/$100.00 ask, you’d lose $10 on 1,000 shares. This is supposed to burden anyone shorting the ETF into paying the fees, rather than pushing that cost onto the long-term fund owners. Plus, some mutual funds have restrictions/penalties for short-term holdings, like >6 months. TL;DR: It depends on what brokerage you go with, how long you intend to hold the funds, and how much effort/money you are willing to put into your taxes. I have moderate-term money goals (3-5 years) and use ETFs for that. *Darn it, that should be “less than 6 months” in second-to-last paragraph. About the Non retirement investing, you can still get the dividends and value increase from when you bought it. I usually set it up as drip (interest going to same investment) but you can also cash out the interest. I’m going on maternity leave soon with my first baby. I’ll be returning to work after 12-14 weeks but only going back part time. I know several girlfriends and close family members with young kids, so I am fully aware of how chaotic/exhausting the newborn days will be. That said, I’m hoping to use some of my leave (and new part time schedule) to do some small projects around the house and hopefully start to make some mom local mom friends. I’ve been fully immersed in career building for the last ten years and while I know childcare will take up most of my time, I’d like to do a few “me” things too. Is this totally unrealistic? Any advice from those that have been there? I don’t have kids but a friend got involved in a new moms group, I think through meetup?, and had a great experience. Mat leave can be really isolating. It’s great to start making connections with moms to be or new moms now so you can have someone to chat with or meet up with during your leave. +1 Mine was called something like “Moms of Spring/Summer 2015 babies in townname”. We went out for lunch at least once a week during mat leave and it was huge sanity saver. Plus, it included both first times mothers (like me) and experienced mothers who had a much broader perspective on infant oddities (also a sanity saver). My advice is that it’s fine to have a few projects you’d like to get done, but you should treat them as optional and give yourself a complete pass on not getting them done. I am so goal-oriented that I had to often remind myself that I needed to just be present and focus on baby, and that my job was to take care of and bond with the baby, and other projects I had in mind were just extras. You won’t regret not getting in your extra projects during maternity leave as much as you’ll regret it if you make yourself feel stressed about getting them done or resentful about not being able to accomplish them. Thanks, that is a good perspective. I also tend to be goal-oriented and I think I’m just worried that I may end up with chunks of time that I squander with phone scrolling or mindless tv watching if I don’t have a few projects kind of lined up. I’ll definitely try and be gentle with myself though and frame them as optional. Re phone scrolling – definitely get yourself Libby or the Amazon e-reader on your phone. I wish I had done this during those long cluster-feeding times — definitely wasted a number of hours with the mindless scrolling! I read a couple of good books during maternity leave, and it felt less like wasting time than scrolling on my phone or watching mindless tv. But also, it’s normal to be tired during maternity leave, especially at the beginning, because you’re waking up multiple times a night. Phone scrolling and mindless tv are normal activities when you’re exhausted and can’t focus on anything else. To OP’s initial question, after my OB cleared me to exercise, I went to a mom-and-baby yoga class, which I kept going to on Saturdays after I went back to work. My husband and I took short walks around the neighborhood. We finished renovating our bedrooms 4 days before baby was born (one month premature), so I did a few projects related to sorting/organizing our stuff, which had mostly been in storage. I tried to get out some and have lunch with family and friends. I went to the grocery store a lot and bought healthy, fresh food. Toward the end of my leave, DH and I took a 4-hour road trip to visit family for a holiday. I took 5 months of mat leave and tackled a few projects (cleaning out closets etc) but mostly socialized. I got out every day – we’d meet my husband or a friend for lunch, go to story time at the library, the museum, baby massage or yoga or just sit in a cafe and read a book. My city does these amazing buggy walks and I made most of my mom friends from this and my prenatal class. It does depend on your baby – my son only napped in the sling or the buggy so he was really portable. I think it’s totally doable. The first month is hard between physical recovery and round-the-clock feedings, but when the baby started sleeping longer stretches at night (which happened around 5-6 weeks) I felt like I had a lot of time on my hands. I read a ton, did some professional development stuff and did some house stuff (mostly focused around baby, like printing and hanging photos and filling out the baby book). I did have a husband who still did his share of the housework. If your partner thinks because you’re staying home, you need to do 100% of the cooking, grocery shopping and cleaning, you probably won’t have much time on your hands. I will say that I didn’t go to any playgroups and didn’t make any mom friends, for a couple reasons: 1) I was concerned about bringing my tiny baby around lots of people (especially before the 2 month shots) and 2) I figured anyone I was likely to meet at a playgroup on Tuesday at 10 am was a stay at home mom – no slam at SAHMs but I knew I’d never see them again when I went back to work, which was happening so soon. I might have felt differently if I had a year of leave and had more time to really connect with people at weekday playgroups. You make a really good point about meeting people who you won’t be able to connect with long term, I hadn’t considered that. Thankfully husband is pretty great and while I know I’ll be doing more around the house (after the initial postpartum time) simply by virtue of physically being there more often, we were both clear that reducing my schedule was more about being more involved with the baby/parenting than household chores. Thankfully we have a cleaning service and lawn service and split other chores pretty evenly, and intend to keep it that way. I agree with this overall, but I will say that I found breastfeeding support groups an exception. I started going around 1 week postpartum with both kids. The other women were a roughly even mix of SAH and working moms. As someone who knew I was headed back to work after 4 months, I wasn’t going to make the effort to go to a “playgroup,” but I definitely made it out of the house to get help troubleshooting my kids’ latching. Only useful info if you are planning on trying to breastfeed, obviously. And ask around to make sure you’re in one that isn’t going to shame you if breastfeeding doesn’t work out (that is, unfortunately, a thing). But my groups were both very supportive of anyone who was trying to breastfeed to any extent, no shaming for supplementation, etc. I’m the Anon at 10:12 – I agree that breastfeeding support groups would be different in terms of the mix of working/SAHMs. Unfortunately the lactation consultants at my ‘baby friendly’ (aka mother-unfriendly) hospital were absolutely terrible and the only breastfeeding support group I knew of was at the hospital and led by those LCs. After I was shamed for supplementing in the hospital (because my 9 lb baby was clearly ravenous and wouldn’t stop crying because the colostrum wasn’t enough for her, and I needed a bit of rest after not sleeping for 48+ hours) and told that giving even a drop of formula would be “the end of my breastfeeding journey,” I was done. The funny thing is my daughter is now 16 months and I’m still breastfeeding so those LCs can just shove it. Just want to say I am sorry that happened to you. Judgemental lactation consultants are the worst. Go you for continuing to BF when faced with all that negativity and judgement. From someone who has been there: Yes to “making new mom friends”. No to “small projects around the house”. The payoff for the former is a million times bigger than the payoff of the latter. Shoring up your social network is absolutely critical at this time of your life, and you can do that at the same time as enjoying the baby and relaxing (e.g., put the baby in a stroller and head to the coffee shop to meet someone). Doing projects around the house will keep you scrambling to use your few moments of downtime “productively” instead of resting. Just an opinion of course, but a much more valuable skill to cultivate at this moment in your life is to learn to let those projects go OR delegate them if they really will improve your happiness. +1 to this. I mean if you find you have time/energy to do projects, sure go ahead, but prioritize building a social support structure. I’m an introvert but was absolutely desperate to meet other new moms, so I really put myself out there and have never regretted it. Thank you! I’m going to have to work on putting myself out there. I’ve mainly had a steady friend group and some are moms but none are super close by. So I guess I’m going to dive into the “making friends as an adult” challenge. Hopefully having a baby will be enough in common to get started. Just make sure you try to gear your mom group activities to those that will contain like-minded individuals. I tried four different times and each was a total disaster of “OMG is that *formula*?” and “why aren’t you taking a whole year off (note – Canada), do you hate your baby?”. Where are you located? What do you want to do exactly? Think about this and how you can accomplish those goals. I’m in Montreal, Canada and took a 15-months mat leave: I had twins and I know it was the only mat leave I would ever be on so I decided early on to make the most of our Canadian mat leave, even extending it by 3 months. My goal was to meet other working mother in mat leave to socialize and to get fit (twin pregnancy is not glamorous). I was out with the stroller every day : I walked about 20-25K steps daily (living downtown and walking everywhere to run errands – not using the car). I also met a lot of nice working mothers at the stroll and roll classes and during a new mom cardio book camp. I ended up being very good friend with 2 working women : we see each other for play date or brunch frequently. I reached my goals but I had more than a year to do so. I don’t want to be mean but you will only have about 4 months of mat leave : this is not a lot of time to do much, especially since it takes about 4-6 weeks to recuperate from labor. I would focus on bonding with the baby and doing a physical activities such going out with the stroller. You can meet other mothers at stroll and roll class easily. The park is also another good place but it is better once your kid is a little bit older, let’s say around 12 months. Thank you! You’re right that my actual leave time will be mostly consumed with recovery and baby bonding. Since I’ll be going back at a reduced schedule I’ll have 1-2 days off each week indefinitely after my leave, so I should have some to hopefully work on other things. I haven’t heard of stroll and roll but it sounds like I need to look into it! I did this and I found it pretty satisfying! It made me feel less helpless as I emerged from the early “can’t sit up without assistance” phase, and I also got some sort of postpartum nesting fever. 1) I actually did projects around my house near the end of my (4 month) maternity leave, but only because my baby was a great napper that would reliably do 3+ hours in one stint by that time, so I was stuck in the house for hours at a time (at that point he wasn’t a great mobile napper). It was nice, but I wouldn’t count on this in the many other cases where it is not doable and you will just feel stressed. 2) Yes, definitely do a moms group! Just to address an earlier point, I actually found (depending where you are?) as long as you are getting together with other moms with similar aged babies there are probably other working moms in it too, also on maternity leave. Also, a couple of my better friends from my groups ended up being SAHMs (they need evening cocktails too!). You will have no time for projects. Wedding vent. A friend is getting married at the end of the year. She told me over the weekend that no one is getting a plus one. Upon further discussion, she doesn’t actually mean “plus one” she means established couples are not invited unless they’ve been together for over a year. This doesn’t affect me personally, I’m a longtime singleton and had planned to attend her wedding solo, but I’m irrationally annoyed by this. First, super rude to refer to an established SO as a “plus one” they should be invited by name or not at all. Second, friend and her fiance haven’t been together for a year yet. No judgment, we’re all in our 30s things move fast. But I can’t understand why the one year mark is so significant when they of all people know that relationships of less duration can be very important. Third, and this is what really gets me, this woman complains every time I host a girls night at my house. My house is small, when I host a dinner party I would much rather cook for and clean up after 10 girlfriends than 5 couples. And the whole point of these dinners is to catch up with my friends, not make polite smalltalk with the men in their lives. I’m so confused that someone who thinks her BF should be invited to a girls night is excluding couples from her celebration of love and commitment. It’s their wedding they can do what they want, but so help me if she complains again about me not wanting to cook for him. I loved Sorano Shibuya in Tokyo (really interesting variations of tofu dishes) and also heard wonderful things about Tokyo Shiba Toufuya Ukai (the latter is quite fancy and needs to be reserved well in advance — I tried and failed to book a week out). I think there was a famous tofu donut / ice cream shop (can’t remember the name) in Nishiki market in Kyoto several years ago, but no idea if it’s still there. For day trips I loved Arashiyama (short day trip from Kyoto, you can borrow a bike at the station and have a lovely and short ride around the river, mountains, rice paddies and bamboo forests). Nara (from Kyoto) and Hakone (from Tokyo, if onsen/lake with maaaaybe a view of Mt Fuji is your thing) might be interesting as well if you have time and haven’t already been. I stayed in a back street in Gion in Kyoto and it was quiet and nice, as well as conveniently located to a lot of food places and tourist sites. Main mode of public transportation in Kyoto are buses, so getting around should be fine as long as you’re not too far away from the touristy center. In Tokyo, I stayed near Shinjuku Sanchome on the Oedo subway line and it was residential and quiet, as well as easy enough to get around; I think it definitely helps to be near a subway / JR Yamamoto line as Tokyo can be quite spread out, with a few areas that act as city centers. Hope you enjoy! Both cities are lovely in May. Sorry, obviously meant to reply to the Tpkyp and Kyoto recs below! It’s cool to vent. Now that you’ve vented don’t spend another stressful second thinking about this. It doesn’t affect you personally and we’re all on borrowed time. Stuff like this is too small and insignificant to spend more than a moment obsessing over. She’s being bratty about her wedding. Lots of people are – she’ll turn back to normal or her regular level of bratty after the wedding. If not, it’s okay to let the friendship lapse – again life’s too short for this kind of person to have a big role in it. Eh, you have to draw the line somewhere and duration of relationship seems more reasonable to me than “no ring, no bring” (maybe I’m biased because I know a lot of very solid, committed couples who were together 5+ years before engagement). A friend tried to convince me that someone she’d met on Match and had coffee with once was her BF because she wanted to bring him to our wedding and we were doing SOs but not plus ones. Yeah, a year seems reasonable to me. Her behavior during girls night is a different ball of wax. Cut the bride some slack. Unless she is spectacularly wealthy (and can therefore afford a massive wedding), or doing the “sheet cake and iced tea” thing, she has a limit on the number of people she can invite. Lines need to be drawn somewhere, and the line has to work so that a hundred people can stomach it. Before you get up in arms about how long she and her fiance have been together, let me point out that brides often draw lines because of her guests’ actual situations. In fact, this is usually the MOST polite way to do things. If all of her guests are either (a) casually dating, or (b) been together for three or more years, then “one year” is a very nice, clear line, and everyone is most definitely on one or the other side of it. +1 to her likely drawing the line with her guests in mind. It may seem hypocritical, but unless it’s hurting someone (eg. there’s a guest who has been with her BF for 10 months), I would assume she has good intentions, not bad ones. What makes you think she’s not inviting them by name? Because she said so. Also, a mutual friend who’s been with her BF for 5 years and living together for 3 received a save the date addressed to Mutual Friend and Guest. Bride knows the guy very well but doesn’t like him, so I guess she didn’t want to include him by name. I didn’t mention this in the OP, but bride is also specifically excluding other SOs that she doesn’t care for regardless of the 1 year rule. Thanks to everyone for letting me vent! I can’t talk to friends irl about this for obvious reasons. I’m already hearing about this wedding from other people so I’m just trying to keep my head down and mouth shut and not contribute to the negativity. OP, those are different issues. Etiquette dictates that fiance(e)s and spouses are always invited, and beyond that, the bride has every right to make a clear and consistent rule about where to draw the line. What she does not have a right to do is to not invite them by name, nor to be snotty to them based on her own personal opinions of them, nor to make a rule and then make exceptions depending on how much she likes people. I agree with the bride. Just b/c you have a guy that you are sleeping with causally from time to time does NOT entitle you to bring him to the wedding and have the Bride’s dad pay for him. Not all women have enough money to spend on giving these guys a free meal just b/c your freind is getting s-x periodically. If that were the case, all weddings would be chock full of guys who were there onley b/c they were acting as $exueal stud’s for the women. FOOEY on that! I’m inclined to agree. Heck, last year I was invited to a wedding and my boyfriend of two years wasn’t included, nor was I extended a plus one. It really, really sucked to drive all the way out there and stay in a hotel for two nights by myself, it would have been great to have him by my side for the trip and meet that wonderful group of friends, but I wasn’t going to moan about it because I also know that most people I know aren’t made of money, and they’re trying their best to have a nice wedding on a modest budget, and that usually means keeping the headcount low, which in turn means that not every invited guest gets to bring someone. It was unfortunate, but I still had a great time and was happy to be included in the festivities! All that said, in this particular case I’m having trouble supporting the bride’s “rule” for which SO’s get to come and which don’t, when she hasn’t been with the fiance for a full year yet. I feel like six months would’ve been more reasonable, or “no ring no bring,” or NRNB+cohabitating couples. She’s also being a hypocrite for complaining about the dinners being girls’ nights that she can’t bring her fiancee to. I get it. Be annoyed for a bit, then let it go. It’s her wedding, drawing such a distinction isn’t unusual, particularly if you can’t afford to be infinitely inclusive with your guest list. Given that she brings this up every time you host girls night, sounds like this is a recurring event. You feel very strongly that maintaining the bond between girlfriends has priority over building friendships with the partners. Isn’t she making the same choice as you are? She sounds like the worst. I’m married with three kids and dearly love my girls nights when they happen. Like my monthly girls brunch just had someone decided to host us with spouses for dinner and I almost don’t want to go because I don’t want my worlds colliding. I can’t imagine showing up at a girls night and complaining that there were no men. WTF. I’m with you. This is super gross. That said, I’d vent and move on. She’s probably super stressed about wedding planning and has to decide a bunch of stuff. You have to make a cutoff somewhere, and since you aren’t personally affected by it she may be giving you the shorthand version but she was actually thoughtful about her approach and chose that seemingly arbitrary cutoff for reasons (e.g., it picks up all her friends with SOs that she’s met). People do weird stuff related to their weddings so I tend to roll my eyes and give people a pass. Sounds like she’s going to have a lot of people who decline to attend her wedding. I understand the “year” rule. It is incredibly expensive to host, and seats are often at a premium. I’ve attended *many* weddings as a single person and not had a date. It’s fine to limit invitations to serious significant others (however you choose to define it). And she probably is inviting them by name. She was just likely talking about the criteria she chose for invitation v. no invitation. I know I’m in the minority here but if they are adults and friends, not family, they get a plus one. That’s it. I don’t care what the etiquette books say. I don’t care if you’re engaged or living together. I would want my wedding guests to enjoy themselves. If they are giving up their time to celebrate a milestone in my life, they get to enjoy themselves. I would hope they cover the extra plate, but it’s BS to not give an adult a plus one. With family, it’s more of an obligation. It’s not just about money. I’m an introvert and we deliberately had a small wedding because I didn’t want to be surrounded by a bunch of people I didn’t know that well. We didn’t do plus ones, but invited SOs that we could invite by name. We knew probably 90% of the SOs already and the other 10% we genuinely wanted to get to know, but I didn’t want to have to spend my wedding making small talk with random strangers that we knew we would never see again. Money was not a factor at all. An invitation is not a summons and if someone truly feels they can’t spend an evening out without a date, they’re welcome to decline. I’ve just gone to weddings alone and it was terrible. I felt so alone, only knew maybe 4 people aside from the bride. At some point there was a couples dance and I was the only person sitting at my big round table. It was humiliating and depressing. That’s why I’m so adamant about plus ones, but if you’re having a really small wedding where everyone knows each other that should be ok.
I’ve scoured the archives, but I’m hoping for some fresh recs for Tokyo and Kyoto. Particularly where to stay in each city and day trips. I think food is going to be a struggle as I’m a vegetarian (no fish), but if you know some fantastic spots with tofu I’m all ears. Thanks so much! This forum has been such a valuable resource for past travels! So late to this but thank you so much for the amazing recs! The daytrips especially sound awesome! For day trips, Nara is an easy day trip from Kyoto and 100% worth it. If you want to stay overnight, Asukasou Ryokan was amazing and easy walking distance from Todaiji, etc. There’s a fabulous tofu restaurant in Kyoto that I…can’t remember the name of. But it had two different set menus, one for full vegetarian (my friend, but you had to call ahead) and one for people who ate fish. Naked hotsprings may not be your thing, but really consider staying at a traditional ryokan at least one night (Hakone, Kyoto, Nara should all have good ones). Some of the ones I checked over the weekend (also planning a trip) have a vegetarian menu. Ryokan stays are expensive but they are the quintessential experience of Japanese hospitality. You will feel like a queen. A stay at a temple in Koyosan is also highly recommended if you have the time to spare. And of course meals there will all be vegetarian. Day trip options from Tokyo are Kamakura and Nikko. Kamakura is smaller and closer while Nikko is farther and larger so might need more days to do it justice. Hakone (45 min) and the Gunma hotsprings towns (3 hrs) are also nearby but I like staying overnight at those places rather than going as a day trip. Day trips to Kyoto include Nara and Osaka (30 min). Staying overnight in Kinosaki (2.5 hrs) is also an option. It’s a coastal hotspring town to the northwest of Kyoto with a pleasant traditional town center along a river. Find a card that you can print out or show on your phone that explains in Japanese that you don’t eat meat, fish or dashi (fish stock). Dashi is in pretty much everything (like chicken broth in the US), so it’s hard to avoid. Soups will likely have it. There are a lot of blog posts about trying to eat veggie in Japan that will be useful. Look up “shojin ryori” Zen Buddhist temple cuisine) which is vegan. I’ve been to Japan twice with my husband who is vegetarian and it is a bit hard, and yes, you may end up consuming fish stock without intending to do so. There are two vegetarian ramen places in Tokyo Station – one on ramen street and one near the train to Tokyo Disney. Also Afuri is a ramen chain with vegetarian options. What kind of casual shoes are you loving for summer? I have some of the world’s ugliest feet and am not a particular fan of sandals. Any suggestions for something cute to wear with skirts and shorts? I ordered my first pairs of M.Gemi over the weekend. One is a pointy flat and another is a cute sneaker I hope to wear this spring and summer. I like Keds sneakers and their boat shoes! I am loving Vince blair slip ons. I tried them on at Nordstrom and then was able to score two pairs on poshmark for a quarter of the price. They have a nice grey and pink that I hope to wear all summer. I also have ugly feet and also prefer the feel of full coverage! I’m the poster on Friday who wrote in about chronic low muscle buildup. I wanted to shout out a huge thank you to everyone who gave advice and words of hope — I’m looking up information on muscular dystrophies from the MDA as well looking into as further testing in the other areas suggested as well. Could you use a shower oil? That might help with the dryness. I mix Aveeno moisturizing body wash (unscented) with something that smells nice (I squirt a bit of both on a mesh sponge). I like Target’s Bliss line (lemon sage, something like that) and Ahava’s cedar orange. Those + Aveeno don’t seem drying to me. Have you tried the Avene Trixera Nutri-fluid (awful name, I know)? It’s got a light fragrance, and no idea how it maps to the La Roche Posay one. It’s supposed to be moisturizing. I haven’t had any issues with it drying my skin, but I also don’t have dry skin issues to begin with. L’Occitane Shower Oil – it’s made with almond oil, smells like heaven, and leaves you moisturized because it’s an oil. Thank you so much for those suggestions. I have never used shower oil – I will look it up the Occitane one. I will also try the Avene Trixera Nutri-fluid (yep the name is not the most appealing but I love the Avene mineral sunblock) and also the Aveno suggestion. I would not say I have terrible dry skin but the skin on my legs get very dry and flaky – Canadian winter that will hopefully end in the next 2 weeks. I also love the Avene mineral sunblock! Actually, I pretty much use Avene everything (face wash, body wash, sunblock, moisturizer) because I have skin allergies and know the brand is safe for me. And I do have dry skin on my legs too. I have to take care of that with a separate heavy moisturizer after I shower. I use Vanicream at the moment, but it is super, super thick. Ditto ditto ditto. I’ve been super happy with the creamier Dove body wash. Doesn’t make my acne-prone skin break out, and Costco carries it for the win. I work in city government and will be attending a funeral for a firefighter who passed away on Thursday. I’m thinking of wearing a black pencil skirt and a top but am wondering if a tan or a light grey top is too light colored. I am actually off on Thursday so will just be attending the funeral, will not be going to work before/after. I think you’ll find that many people will just be wearing their work clothes, so I think a light gray top would be fine. All the firefighters will most likely be in their dress uniforms. So, more formal than many funerals. I think light grey sounds perfect, actually. I’d like to start taking better care of my skin but am overwhelmed by all the options. There are so many serums, creams, gels, masks, etc. from so many brands that I am lost in the options. Does anyone have recommendations on how to start figuring this out? Is there a way to get cheap samples of lots of products to try them out? I’m early 30s if that’s relevant. If you think that researching, reading k beauty blogs, etc sounds too overwhelming and you have the money, would you consider a set from Sephora? I am thinking one of the Drunk Elephant sets or Ole Henriksen or something like that. If you have a Sephora close, you could also stop by and talk about what your skincare concerns are, and they can give you some good samples to get started. Or do you have any local beauty shops where you are? We have one and the woman is really knowledgeable and great about giving samples. I would start with The Ordinary. They have several sample regimens on their website and the products themselves are pretty cheap. Do you already use sun screen daily and a retinol? If not, that’s a pretty solid foundation to start with before you do anything else crazy on top of it. I use LaRoche-Posay, which is French, but available in drugstores. Because cosmetics safety testing is better in the EU than in the US, I tend to favor European skincare products, and the documentation for actual effectiveness of the products I selected (see below) was good. . Personally, I don’t mess around with masks and double-cleansing, and all that. I did some reading (mostly from dermatologists/health-related sites, not beauty blogs), and also searches on the products that actually have demonstrated clinical results. I found that the consensus seemed to be that there is reliable clinical evidence for the effectiveness of retinols, hyaluronic acid, and Vitamin C. I cleanse with gentle face wash at night (water in the AM), apply retinol (night) or Vit C (morning), hyaluronic acid, and then moisturizer. In the mornings, also sunscreen (also LRP). Start wading through the SkincareAddiction subreddit. You can get as basic or as intense as you like. Start with their wiki and then search keywords that concern you (SPF, aging, texture, etc.). If you do get interested in going further and want to go down the rabbit hole, the AsianBeauty subreddit is good for that. Generally speaking (very wide-sweeping characterization, here!) the difference is that western products like to be multi-purpose formulas, whereas Asian products (often shortened to “K-care” for Korean skin care, though other countries make great options also) are broken out into many steps that you customize and layer for your skin needs. Layering is particularly important if you intend to use tretinoin (retinols), which can cause sensitivity during the adjustment period. Buffering, or layering moisturizer underneath, can help get through that phase. I’d use the products from The Ordinary or Paula’s Choice, both of which are excellent quality but inexpensive. I would start with a really basic routine. Morning = cleanse, vitamin C serum, moisturizer, SPF. Evening = cleanse, retinol, moisturizer. Sub out the retinol for a chemical exfoliant once or twice a week (BHA/salicylic acid if you have oilier skin; AHA/glycolic acid if you have drier skin). Seems unlikely that’s a quote. I’m sorry, were you in the office with us? Yes, she said exactly those words. And has repeatedly said variations of them. And she has a whole slew of online reviews attesting to how frequently she blames patients…but she’s one of the few psychiatrists who takes insurance, so I took my chances. Anyways, thank you so much for your helpful comment. Why is it hard to believe there are terrible doctors out there? I wasn’t there, you weren’t there, none of us were there except for the OP. Either the OP is a drama queen, or she fell victim to a psychiatrist who got into the business because she (the doctor) has issues and enjoys working them out on other people. Yes, these people exist. Yes, it’s scary. Let’s take the OP at her word and provide helpful suggestions; if the OP comes back five more times, each time claiming that reputable doctors are doing this to her, then we can address the issue of her perception. I’m sorry that happened to you OP. Tax question – Assuming I can itemize, I still get a deduction for my charitable donations of goods (ahem, clothes) to Salvation Army, etc., correct? I do my taxes with Turbo Tax and I use their calculator to estimate the value of my donations. I have a friend who is a tax attorney. When the new tax law came out, she told me a bunch of things that were flat out wrong. Now she’s saying that donations to Salvation Army, Goodwill, and similar are no longer deductible. I understand that you only get to deduct donations if you itemize, but I can still itemize. TurboTax seems to think I get to deduct my donations. Am I missing something? You and TurboTax are right and your friend is wrong. The new tax law actually raised the charitable giving deduction limit from 50% to 60% of your income (although I assume donating some old clothes is not getting you anywhere near either threshold, and if it is you probably need to consult an accountant to make sure it’s all above board). The standard deduction for a single filer was increased to $12k, so only if you have deductibles worth more than that is it going to make a difference. Please tell us the name of your tax attorney friend so we can never, ever use her! Yes, donations are deductible. They are frankly saving my bacon this year because I live in a high state tax and property tax state (CA) and the $10,000 cap on those combined is a joke. Somehow, accidentally, I had the foresight to be extra charitable in 2018. Has anyone taken up golf later in life? I’m an attorney, 30, in the Midwest, and there are so many golf events that I know I’m missing out on business. I have always thought of golf as an expensive and time-consuming sport, but I’m in decent shape, own clubs for my once-a-year-hack-a-thon with my family at a par 3 course, and would like to be good enough to not embarrass myself at a best ball tournament. Any suggestions? Do it! I love golf, but I don’t currently have enough time to fit it in right now. I would get some lessons, and then start playing as regularly as you can! Following! It’s on my list to learn this year, but I’m not sure where/how to start. Also Midwest/Chicago area. Having the lessons helped me enormously in confidence for the events I attended. We played best ball format and while I couldn’t hit those long drives my male colleagues were hitting, I was able to hit straight drives onto the fairway that didn’t slice or hook, and we often used my drive as our official ball because it wasn’t in the trees or the water or sand hazard. I was really surprised. I haven’t kept up with it. It’s an enormous time commitment to maintain or get better at golf, but as long as you know the basics, you’ll feel a lot better. Read a little about golf etiquette too, like not talking during someone’s swing, and not walking on their line to the hole on the green – things like that are just as important as playing well. Terrible callus build up on feet what to do? Had a couple little sections peel off and it’s deep. Like a quarter inch drop off. Baby foot peel isn’t getting enough and I dance so can’t be shedding like that. Get a pedicure. Tip well. They’ve seen worse and it will help!! For in between pedicures, consider one of those battery operated sanders for your feet (mine came from Costco) – they come with a variety of different grades depending on how rough your feet are. Work on them every couple of nights and then sleep with foot cream and socks. Put castor oil on your feet right before bed, and slip on a pair of cotton socks. I did the castor oil treatment for plantar fasciitis at the recommendation of an accupuncturist and it did not work for that in the slightest, but my feet are baby soft now. I’m kind of shocked at the difference. I always used lotion on my feet before the castor oil. So it’s not just moisturizing. The castor oil really made a big difference. I recently became a member of a nonprofit that has only women members. We meet once a month and members are required to attend a certain number of meetings per year. Members get together for service projects throughout the year, but the meetings are the biggest gatherings – usually we have about 50 people per meeting. Due what sounds like poor planning/unsupported decisions from recent boards, the finances have taken a huge hit. Dues have doubled, membership has declined, and almost all member ‘benefits’ (i.e., dinner included with dues at monthly meetings, free happy hours/socials/banquets, etc.) have been eliminated. The meetings start with a ‘social time’ but no one except the meeting organizers arrive before the actual call to order. I suggested bringing back wine/appetizers to help get people talking and involved and give them something for dues. There might not be money in the budget, though. My business could afford to sponsor something like Trader Joes’ two-buck-chuck wine, soda, and maybe some light appetizers (crackers/cheese) for every meeting. Most of the members are in their 30s, some have kids, some don’t, most are working professionals – so probably like the demographic of this board. Would you turn your nose up at inexpensive wine? No. Another idea is hold the events at a restaurant or bar and pay-your-own but get a discount? Good grief, no. At an expense account dinner last week, we had two different $175 bottles of wine that didn’t taste all that much different than the $15 bottles H and I normally drink at home. And aren’t people always raving about Costco wines? You could provide the inexpensive wine and ask some people to bring a bottle. I think the Charles Shaw label is a little to recognizable though. How about something less well known as being cheap (but is still cheap)? I agree that at any charitable event where you want people to give money, the absolute best strategy is to get the wine flowing. I’m that person who runs around filling everyone’s glass at school auctions and I can tell you, it totally works. I am the former president of a social organization for women that has similar demographics, and had similar budget issues a few years before my term. As a result, the decision was made to switch to more in-home events (with the hostess providing a small food spread and getting a $25-50 budget), asking members to bring a bottle of wine/appetizer/dessert, and cash bars. I think your plan sounds great, but I’d suggest avoid two buck chuck (as mentioned above) – maybe instead go buy 5 $10 bottles of wine? Thank you to whomever suggested an overnight soak of coconut oil for dry brittle hair. My hair feela fabulous today! On Saturday night, my DH & I attended a reception for two of his colleagues who are retiring after 29 years as professors at the local university. One of their former students said something that made me both smile and tear up a bit. “Dr Mrs ____, you showed me how to be a woman in mathematics, and that it was normal. You showed me how to be a wife and a mathematician and it was normal. You showed me how to be a mother in mathematics, and that it was normal.” The former student is now a full professor in her own right, with two young children and some prestigious research to her name. Another colleague talked about her contributions to the promotion of women & under-represented ethnic groups on campus, and how she had led the way. She founded the committee that led the effort to promote women in higher education, then added the promotion of ethnic minorities when her female students of color told her that their ethnic background had become more of hindrance than their gender. As she’s been working towards retirement, she’s removed herself from the committees like this, and everyone agrees that the university community committees haven’t been the same without her. I can only hope that when I retire that those I’ve influenced speak of me with the level of respect, admiration & genuine affection that her students, former & current, do of her, and of her husband. Aww, that’s great. What a nice thing to hear. Aw I love this! My mom is a math professor who has mentored a lot of female and minority grad students. She won a huge university-wide mentoring award recently and I got to hear people say similarly nice things about her. It was really awesome and inspiring. This is lovely. Thank you for sharing. And yes, life goals! Last summer, I was on several conference calls (about 6-8 people) with a senior level person from another company. After the project, I added this person on LinkedIn even though we’ve never met. He accepted. I recently applied for my dream job with a company and he is very high up at their parent company in the same niche field. Would you reach out to this person for a possible connection on the job? Am I out of line since we don’t know each other that well? And is he too far removed since he works for the parent company and not the actual company where I applied? Absolutely reach out. Reintroduce yourself, mention the project, and tell him you heard about the job and applied. Say you’d appreciate any tips and a recommendation from him. This is what LinkedIn /networking is about. Definitely use it. Please talk to me if I have slid down a slippery slope into unhealthy territory. I have always had a robust skincare routine, which is partially a hobby, partially out of vanity.This year my salary more than doubled, and I started dabbling in med spa treatments, finding them somewhat habit-forming. I had several microneedling and Clear & Brilliant sessions over the course of 4 months, convinced that once that was complete I’d just have to focus on maintenance. Then I had 2 weeks off of work so I got (subtle) lip injections, which I liked but I’m undecided if I will do it again. Then yesterday I went in for Botox in my jaw area to treat TMJ, but walked out with that + Botox in my crows feet, 11s, and brow tail. Is this unhealthy? I can’t think of anything else I want “done” and yet I keep getting more. I think I’m just happy seeing real, somewhat overnight results, but i’m worried I’m in body dysmorphia territory. I’m 30 and have objectively great skin, but I’m always wowed at the results I see from the medspa. I don’t want to overdo it. Tbh it sounds like normal beauty “maintenance” of upper middle to high income women in their 30s. I think the bright line is when you start getting irreversible or surgical procedures or if you start not feeling like yourself. If it makes you feel better to have a more subtle bright line, I’ve always held off at a “the best version of myself” mantra when it comes to beauty. So enhancing the quality of your skin with treatments is different than changing your lips to a new unnatural size. In addition, maybe scheduling out your treatments for the next 6 mths and only doing those treatments will help limit you as well. I personally do regular facials, laser hair treatments and mild chemical peels, and don’t find anything wrong with it. I’m not sure I agree – I’m late 30s and know only a couple of people who’ve done Botox at all, and they’ve done it in one specific area that was bothering them. We’re all high earners. Getting Botox if you want it is fine, but to me it’s a red flag that OP walked in to get Botox for a medical problem and left with a bunch of cosmetic Botox. It sounds like she’s very suggestible and lets other people tell her she needs to fix problems on her body that she didn’t think she had. TBH I was more than open to the cosmetic Botox, and pushed the conversation in that direction more than I’d like to admit, expressly asking the nurse what she would recommend cosmetically. When she told me the number of units/price I was like, why not? I also picked up Latisse. I’m embarrassed by it for some reason. Huge red flag for me, and the reason for this post more than anything, was that I lied to my husband. I told him I had 60 units of botox in my jaws. It was 40 units in my jaws + 20 units elsewhere. IDK why I lied, he wouldn’t have been mad. I am just embarrassed and want it to be “my little secret”. I do not have secrets though so I am feeling a LOT of cognitive dissonance/guilt. Do you have a history of thinking about or treating your body badly because you have a standard you are trying to reach? (e.g., eating disorders, over-exercising, obsessing over details, lots of fretting and anxiety about your looks). Are you overdoing social media and filling your mind with images of “perfect” women with beautiful bodies and skin? Are you reacting to turning 30? Feeling insecure about something and taking it out on your appearance? Feeling stressed and using skin and face care as an indulgence and escape? And the OP is only 30. I’m also late 30s, and this would be a lot amongst my social circle. I, too, find it worrisome that the OP went in for one thing and left with a ton of other treatments. No, you know way, way more than just a couple, they have just never told you about it. If you were 40 I would say that’s fairly normal. But you’re only 30 and the rate seems to be increasing without an express intention to address specific issues (e.g. going for TMJ leaving with the full package). Suggestions would be to one or more of 1) pick a schedule and stick to it, 2) take a 3 month holiday for all things and then re-elevaluate, 3) decide that you will not do additional services at one appointment – book to come back which avoids making decisions under pressure that you later regret. I read an article once about why some women end up getting too many procedures, too much filler, etc. Basically, they go for their first procedure, wherever it is, and it’s such a major change and big improvement that they get a zing of excitement from it and a feeling of well-being. Then the excitement wears off, people stop offering compliments, and the woman starts looking critically in the mirror wondering what else she can do. Unfortunately, compared to that firs time, the marginal improvements are not as major, and she never gets that same buzz. She keeps getting more and more treatments chasing that high but never quite achieves it. It’s a form of dysmorphia but specific to cosmetic/plastic surgery procedures. I am not here to dis what you’ve had done so far. I’ve had Botox before though I’m not currently using it. It’s the fact that you seem concerned and that you’re hiding it from your husband that kind of alarms me. If it helps you with accountability, talk openly with your husband about what you’re thinking about having done before you do it. I’m not saying ask him for permission (that is not how I personally roll) but just air it and don’t make it a secret and see how it feels. Yeah I can say this rings very true. Also part of it is that things become less of a big deal with time. 6 months ago I would never have considered Botox, but now I’m like, its NBD everyone does it. And laser treatments? Chemical peels? Whats the harm in that? I will say though after trying filler, I was very curious to have it done but I think I have it out of my system. It was not enjoyable to have done, the results are not life-changing, its expensive. I’m excited to see how the Botox looks (takes a few days to set in). Maybe it will be meh and I won’t get it again for 5-10 years! Thanks all! Your comments are very insightful and helpful. I don’t know the answers but I have a lot to think about. How do you manage An in law who is angry that you spend more time with your own family than them? My husband does not hang out with his younger brother that often— they are over ten years apart, have different fathers (though there is affection and love when they do meet). I’m closer to my sister— we talk often, though she lives about six hours away— and I don’t see her as often as we would both like. Both our siblings have kids, but husband and I do not. My mother in law seems to get very resentful and angry when we see my sister’s kids ( which is about 7 times a year), and keeps bemoaning the fact that her grandchild does not have a visit from us as often. The reason for this is that my husbands brother just does not initiate or organize anything, and never visits us. Instead, we see his daughter who is two, when we visit my mil. She gets very petty and angry that we “ don’t care” and why don’t we stop by when she babysits (they leave niece there for 8 hours at a time two or three times a week). Her relationship with my husband is going well, and then she gets all angry and cancels plans with us when she learns I’ve seen my family. In some ways, we do see my family more often, because they visit or come to our home , and she does not like to see us at our home, but prefers that we drive an hour to see her, even though she comes to out city one a week for appointments. We have both endured this attitude for 20years, and just don’t know how to respond any more. Any suggestions would be most welcome. That is sickeningly manipulative. She has no right to punish you for seeing your sister. My advice is to nurture the relationship that your husband has with his brother, but push way back on the relationship with MIL. She is being totally irrational for the purpose of getting you to dance to her tune. The only way to “respond” to these people is to completely disengage and ignore them. I agree with this assessment, though sadly, we allhave a good time and interaction and then she gets resentful, and the pattern is that I feel upset and sad. I’ve asked my husband not to mention when we see my family, and he refuses saying that he doesn’t want to hide the fact he likes my family. I think you have a husband problem. He should either be willing to 1) Limit the information he gives his mom about you and your family, including visits or 2) Actively manage the relationship with his mom and spare you from being the subject of her anger. Ideally, he would do both, but I think he really has to be committed to least one. Good for your husband. It sounds like the thing to work on here is your pattern of feeling upset and sad. Since you’re been doing this relationship push/pull for more than 20 years, it’s not going to feel good for you when you begin to disconnect from it emotionally. Your mil isn’t going to change, so the part that changes is that you learn how to respond differently. This is the time when some counseling can help, because an outsider can give you strategies for managing your own responses and emotions — after 20 years, you have lots of practice in one pattern, and you’ll need to begin practicing a different pattern. +1. The only thing you have the power to change is your expectations for this situation. You can get yourself to anticipate as a given that she will blow up at some point, so then you shrug and say, well, we had three hours with MIL that were pleasant. This is the only outcome you can reasonably expect, apart from cutting her out of your life. Getting professional help would probably help you get to that point of acceptance. I think, given what you’ve said here, if husband insists on being upfront with his mom about seeing your family, then he gets to manage her feelings about it. He gets to listen to her whine and then politely but firmly explain that you’d be happy for her to bring Niece to see you or arrange to have a gathering at her house. He runs first line of defense on this. Not you. Over the years husband has tried not telling her, being upfront, as well as managing this the best he could. To be fair, I know he always stands up for us, and defends us. I think the issue is my own anxiety as I want them to get along, and I feel responsible (even though I know I’m not) when he gets off the phone and she was in a bad mood because he did things with my family rather than them. I think [email protected]:24 has a really good read on the situation! It’s great that husband always stands up for himself and you. Make sure he knows you love him no matter what his mom says to him, and put it out of your mind after that. Thank you for the suggestions. I agree it is certainly my own anxiety. We all have a good time otherwise, and I know that it is a sore spot for mil as bil’s wife hails from a much larger extended family and mil feels as though her very small family is drawn in different directions. Your husband is trying to be the hero that no one asked for. Your sister probably does not give two whits how your MIL feels about her, and your husband verbally championing her with this unneeded solidarity is only making his and your lives harder. He needs to manage the actual problem, which is that his mother is a dragon who hoards love and attention like gold that can’t be shared. He needs to do whatever will get the two of you out of the nest un-scorched. If that means playing dumb about how often you see your sister, so be it. Lol at the dragon comparison. Sounds like spot on assessment! Stop telling her about when you see your family. Be vague if she asks. Discuss with DH some limits and stick with them. Accept that she may not be happy with those limits and you will have to be polite and consistent for a long period of time. If you are considering having children, this is a great opportunity to set boundaries. Why are you telling her where you go and what you do? I avoid telling her, and husband used to avoid as well. I agree we should stop, though she says we are boring when we have nothing to share! Would you rather be boring or anxious? Great point…I would certainly like to be less anxious. This sounds exactly like my family! My family lives very close by and and are big activities people, they are always making plans and inviting DH and I to join. My in laws live about an hour away and are…not activities people. Their idea of a visit is sitting on the couch for 3 hours playing with our dog while we watch. They are very resentful of the fact that we see my family almost every weekend, and yet they never initiate plans. And when we try to initiate plans, they cancel at the last minute 9/10 times. We see them about 4-5 times a year as a result. No advice, just shared commiseration. Well, this isn’t really what you’ll want to hear, but I do think you need to make more of an effort to build a relationship with your niece – regardless of what your MIL thinks or how poorly she’s expressing it. I 100% understand the challenges of getting together in person when the other group won’t organize or come to you. Would it work to Facetime while your niece is with your MIL? This is a great suggestion. I had to leave and am returning late, but I think this is a reality that we have to reach out to niece too. Inlaws drama are never reasonable and you cannot reason with them in any way. Any time you have aggressive or passive aggressive people involved, the best way to deal with is being very diplomatic – i.e. restrict information and disengage when they are in battle mode (if you’d still like a relationship with them) and be polite and politically correct. Your husband cannot feed her ammunition when she asks for it (as in fall for seemingly genuine questions which are really traps like – you guys are boring. what else do you do?) and expect her not to explode! Read Captain Awkward website that helps draw boundaries and deal with ppl like this. Very interesting read and at the same time, very helpful. I’d like to run for office sometime in the future (i.e. not next cycle). I’m 29 and live in Texas. I’ve heard of a lot of programs that basically offer training on all things political- any that you’d recommend? I don’t even know how to think about thinking about doing this. I bet your party of choice has a local or state workshop on running for office, my recommendation would be to check there first. I participated in a non-partisan, just informational League of Women Voters how to run for local office workshop in my town and then last fall actually did run for and won a seat on my city council. The LWV workshop was pretty essential in my decision making. I’d also recommend starting to get involved in your party now so you can make connections. I don’t know about where you are, but where I live there’s a local Democrat organization that is a subsidiary of the state D’s and they have monthly meetings and lots of events. I don’t go to the monthly meetings but I’m on their email list and I do go to the events to see and be seen, essentially. +1, when you declare your candidacy, the response will likely be “okay, what have you done with the party?” Think about the type of background you would like to see in a candidate. Annie’s List in Texas provides candidate training geared towards progressive women. They offer a Candidate 101 for a good introduction. The courses are offered a few times a year and in various cities around the state. What is your age and what percentage of your income is your net worth? I’m 31 and my net worth is 240% of my income. 54. Net worth around 12 x my annual income. 42. Net worth is 8x my annual income. Almost 30. Thanks to student loans (which I just paid off, my net worth is about 90% of my income (this doesn’t include my husband’s student loans, which are not in my name but are part of what I consider our shared debts). We hope to have his dealt with in the next 7 years (he’s got a little bit of residency to go and once he finishes, we’re going to try to keep our expenses the same as they are while he’s a resident and throw all of the excess attending salary at his loans). After that, hopefully we can contribute more to our long-term savings/retirement (right now it’s just my 401K). 39. Net worth is 21 x my annual income. This is mostly because DH sold a couple of companies and did quite well. I’m 33, married and have a HHI of $150k and net worth of around $600k (including our house, but assuming no appreciation in the house). $200k net worth if you don’t include the house, pretty much all in retirement accounts. Is it time for another Marketwatch article already?!? honestly, I was just curious, but yea, I get that the question was likely to annoy/be controversial to a lot of people. this question doesn’t really mean much of anything if you don’t include marital status. It is so much easier for someone who is married to accumulate a high net worth. I’m looking to book a blowout while in NYC and my first thought went to DryBar. I was reading some reviews of the DryBar closest to where I’m staying (UES) and there were enough complaints of styles not lasting that I’m feeling the need to ask for other opinions. I have thick (thiccck) wavy/curly hair that comes down past my bust. I would be looking for a sleek, straight style so I’m not worried about curls lasting, however, I am worried about my frizz being tamed properly so I’m able to touch it up myself with my own straightener/product. Think I’ll be in the clear? I’d normally do my hair myself but I’m flying with only a carry on and as I won’t have access to a blow dryer, I’d have to lug mine + my straightener. I liked Drybar although I found it expensive (maybe it was the dollar conversion). Check out Blo as well, if you’re looking for more options!